If hydrogen could be made into a metal, wonderful things could happen! Unicorns would dance in our streets, we could settle on Alpha Centauri, lions would turn to vegetarians and John Lennon would be president. But let’s not get over excited and better start at the fundamentals. Our periodic table is divided by a blurry line between metals and non-metals. If the elements could choose a president, it would be a metal, probably. Even if arsenic and antimony are indecisive right now and we don’t know if meitnerium or darmstadtium are metals at all, they’ll have a majority of about 80% of all elements. Safe bet. Actually, we are not too sure what defines an element as a metal. Well, a metal is shiny. It’s malleable. It’s opaque. It has good electrical and thermal conductivity. And typically it is hard. But any of these properties are open for discussion. Ask an astrophysicist. Metals are usually arranged in crystalline structures and electrons have any freedom to move around the atoms. This is the explanation for their good conductivity. Some non-metals can be made to show all the specifications needed to disguise as a metal. High pressure presupposed. These allotropes make a definition even more complicated, so let’s change the topic. Let’s talk about dedication. Meet Isaac F. Silvera, a physicist and a professor at Harvard. His first important paper from 1980 discussed the properties of metallic hydrogen. Theoretically, of course, because there is no metallic hydrogen. There were only predictions that someday it could be possible to motivate some willing hydrogen atoms to form a crystalline structure, if our arguments were convincing enough. Almost forty years of sciencing the hell out of putting elements under high pressure, Silvera and his team may have finally succeeded. And by high pressure we talk about something like 470 gigapascal. Here on earth we have something like 100 kilopascal at sealevel. Take that and multiply it with 4.700.000 and you get a glimpse of what „high pressure“ means. When this kind of stress was put on innocent hydrogen atoms, they changed their appearance as the scientists watched and made snapshots. They shrunk and started to form crystalline structures as spectroscopic measurements later showed. 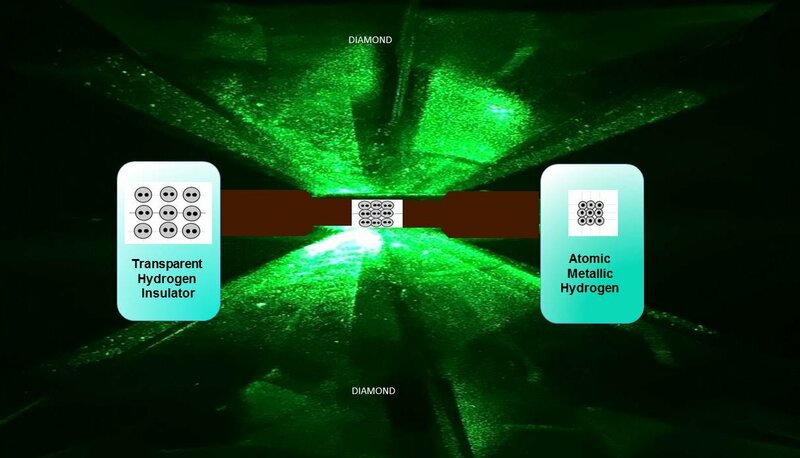 Metallic hydrogen, as predicted decades ago. A whole scientists life. So, there it is. What are the properties of this new metal? It seems to be metastable. Like a diamond made out of carbon is metastable. It doesn’t change back to carbon when you dig it out. And it could be a superconductor. At room temperature. Which could have many applications in real live. Cheap maglev trains or lossless power lines or the most powerful rocket propellant ever. But let’s not jump ahead too much into science fiction and stay on the ground. In 2012 Mikhail Eremets and Ivan Troyan from the Max Planck Institute for Chemistry in Mainz, Germany already claimed to have – maybe – forged this „ holy grail of high pressure physics“ (Silvera). But these results couldn’t be reproduced so far. And the team at Harvard just recently started working on their small sample. We don’t know very much of its properties yet. Of that metal. That never existed on earth before – which would be fascinating enough. For this blog. You can find the paper here and a little too enthusiastic article here.